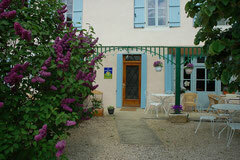 English - Site Jimdo de la-belle-epoque-thenissey! Welcome to « la Belle Epoque », located in Thenissey, an authentic old village nestled in one of the valleys of the beautiful Auxois region in Burgundy. Our bed and breakfast is in the old Café de la Gare that we have renovated, and we offer you a peaceful, relaxing atmosphere ideal for weekend get-aways from busy city life. The beautiful countryside is perfect for country walks or hikes, cycling, and horse-riding, (there is a ranch in the village). For those of you who are more adventurous, there is also rock-climbing on the cliffs of Hauteroche, or 4x4 jeep driving in the woods of the Chateau de Thenissey. We are also near the automobile and motorcycle racing track in Prenois, and the cliffs used by hang-gliding clubs. There are lakes for fishing and swimming nearby, as well as tennis courts. This region has many cultural and historical sites to visit: the famous site of the Battle of Alesia, the medieval village of Flavigny-sur-Ozerain , the Chateau of Bussy-Rabutin and the Abbey of Fontenay are all just a few minutes’ drive away. You can also explore the medieval town of Semur-en-Auxois and if you’re tired of driving, why not take the train into the center of the capital city of Burgundy, Dijon? It’s only a 35 minute ride and there are 7 trains per day to Dijon that leave right from Thenissey station, which is just a 1 minute walk from here! For your comfort we provide you with a large queen-sized bed (160 cm) and private en-suite bathroom and toilet all in a cozy 19th Century French country-style decor. We’ll serve you a hearty breakfast in the morning. You can taste our home-made breads, jams, and yogurt, with a choice of pancakes, muesli, or farm eggs, ham and cheese, all served with coffee, tea, milk or hot chocolate and a glass of fruit juice. 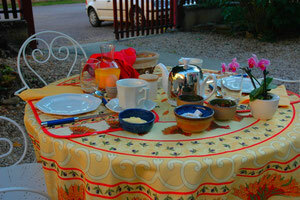 It is possible to dine in the evening if you reserve in advance. We suggest a full traditional meal: first course, main course, cheese plate and dessert with wine and coffee included. We can also prepare picnic lunches for your day out or your hike. Room rental: 65€ per night, breakfast included. 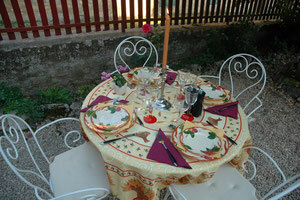 Full dinner with apéritif and coffee: 20€ per person. Picnic lunch: from 6-10€ according to contents chosen. Weekend hiking option: possibility of driving hikers to Sombernon or Alesia on Saturday morning, so that they can walk back to Thenissey late afternoon.